The proposed budget axes funding for programs proven to save Africa’s wildlife. Add your name. Africa’s wildlife may go extinct because of: wildlife trafficking? Habitat loss? Climate change? Budget cuts? It’s true. President Trump’s proposed 2020 budget severely cuts funding for programs that fight illegal poaching, stop wildlife traffickers, support biodiversity, and protect habitat. We must act now. Send a message to President Trump and Congress letting them know that you oppose cutting protections for Africa’s wildlife. Here’s the bottom line. If we don’t act now, Africa’s wildlife will be sacrificed to save a tiny fraction of the federal budget. 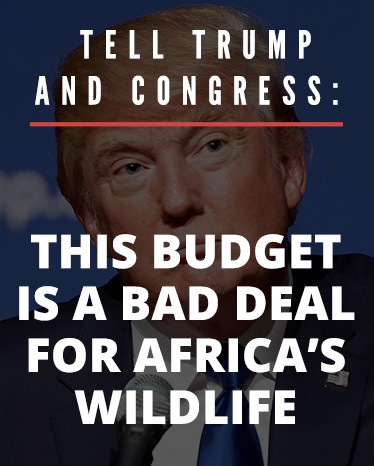 Please help AWF send a strong and unambiguous message to President Trump and Congress: this budget is a bad deal for Africa’s wildlife. I’m a member of African Wildlife Foundation’s community of wildlife advocates and one of the millions of people who want to live in a world where elephants, big cats, apes, and other wildlife thrive in Africa. I am horrified to learn that vital programs to protect these endangered species are facing severe cuts to save what amounts to a tiny fraction of the federal budget. This proposed budget jeopardizes U.S. national security by cutting international wildlife trafficking funding. 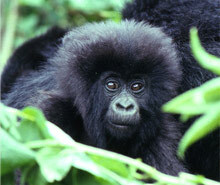 Proposed cuts to USAID’s Biodiversity Program, the General Environment Facility, and U.S. Fish and Wildlife Service threaten already vulnerable wildlife and wild lands. With less funding, African Wildlife Foundation – one of the world’s oldest and most trusted conservation organizations – will have to reduce or eliminate programs that stop the slaughter of elephants and rhinos, protect wildlife habitat, give impoverished families livelihood alternatives to killing apes for bushmeat, identify and apprehend wildlife traffickers, and deploy sniffer dogs to catch ivory smugglers. In FY 2019, Congress rejected proposed funding cuts to programs like the USAID Biodiversity Program, the Multinational Species Conservation Fund, and the Global Environment Facility. Please continue to support U.S. leadership in the fight to conserve Africa's wildlife and end wildlife trafficking. AWF meets the 20 Standards for Charity Accountability. The African Wildlife Foundation is a 501(c)3 nonprofit charity. Within the limits of law, your gift is 100% tax-deductible. For tax purposes, our EIN is 52-0781390.